Note: This tutorial is for residents of India only. If you are from any other country, you should read the Bitcoin buying guide for Coinbase. 2018 update: Unocoin and ZebPay used to be one of the first few exchanges from India. These days there are plenty of good options and you can find an updated list here. Have you been planning to buy your first Bitcoin in India? And do you also have no idea how to go ahead with this? Well, today is a good day for you. 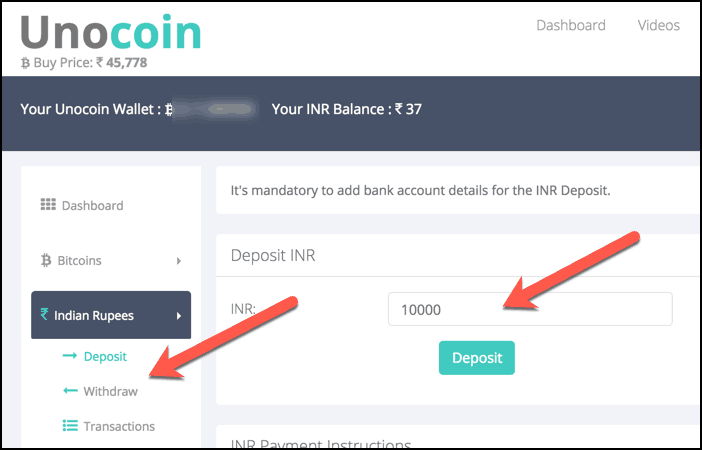 In this step by step guide, you will learn how to purchase your first Bitcoin in India. 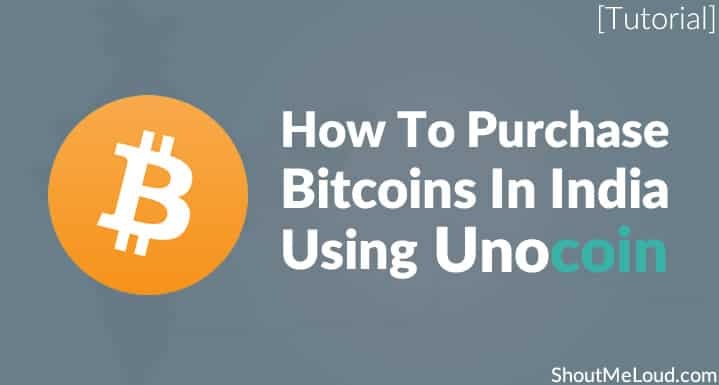 For this guide, we are buying Bitcoin from the popular Indian Bitcoin buying & selling website “Unocoin“. If you wish to buy Bitcoin In India using cash, you should use Localbitcoins which is a P2p market. I will be doing a detailed guide on Localbitcoins in coming days. If you want to know about all of the other popular Bitcoin websites including exchanges in India, read this detailed post. 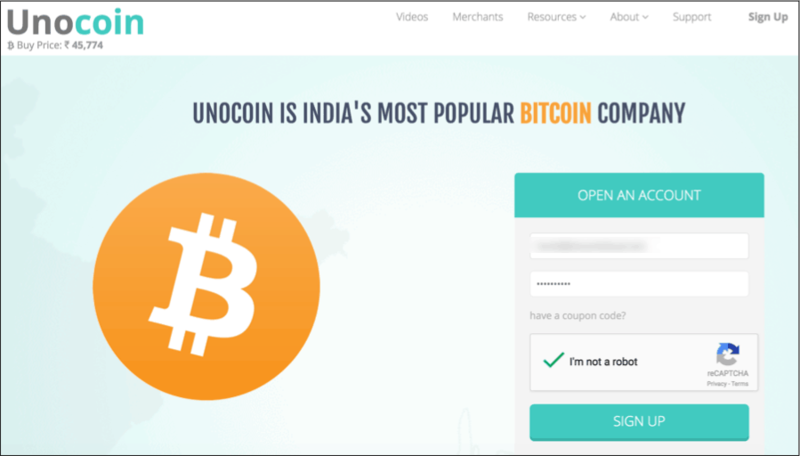 In India, Unocoin is one of the most popular website to buy & sell Bitcoins. It’s newbie friendly because the interface is more user-friendly & they have both an iOS & an Android app. Bitcoin is legal in India. However, it’s not regulated by RBI. On December 24, 2013, RBI issued a press release on virtual currencies (like Bitcoins, Litecoins, Etherium, Dogecoins, etc.) stating that creation, trade, and usage of virtual currencies as a medium for payment is not authorized by any central bank or monetary authority. Unocoin is a legal website to buy & sell Bitcoin. Well, it’s a no-brainer that RBI & the Indian government will start taking Bitcoin seriously as it’s being adopted by more users globally. I’m pretty sure you are already aware of how popular Bitcoin & Blockchain technology has become in the past three years. But for now, purchasing Bitcoin is sound advice & a risk worth taking. 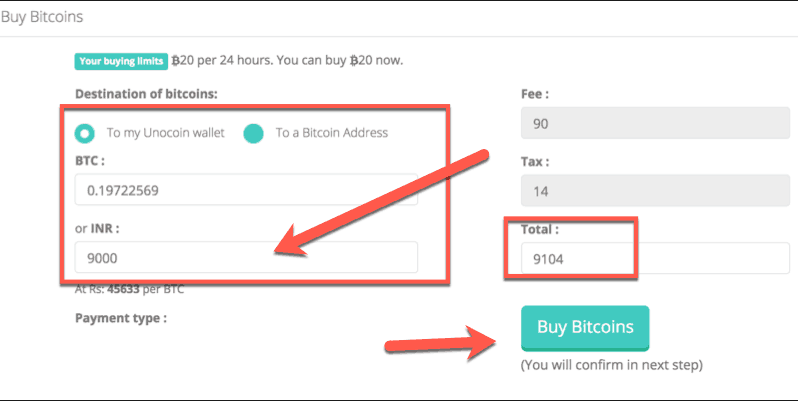 Without further ado, let’s follow the steps below, get our first Bitcoin wallet for free & then purchase Bitcoin. You will get a registration verification email from Unocoin; click on it to verify your registration. Log in to your newly created Unocoin account. The next step is to complete the KYC. Start by adding your bank account details. This is where you will also receive money when you decide to sell your Bitcoin. The bank account should belong to the same person/organization operating this Unocoin account. You may only add one bank account. In my case, I used my Passport + my Pan card to verify my account. This KYC verification will take about a day & once that is done, you will be able to start buying Bitcoins. Note: Even if you don’t buy Bitcoin at this time, you still have created a free Bitcoin wallet address for yourself. You can use this at any time to receive Bitcoins from anyone. To purchase Bitcoin, you need to add funds to your Unocoin account. 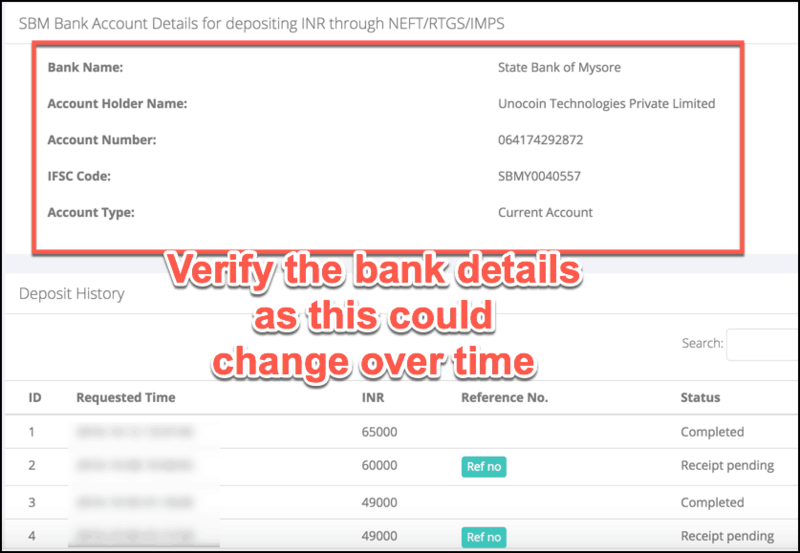 This can be done with the help of NEFT/RTGS/IMPS. 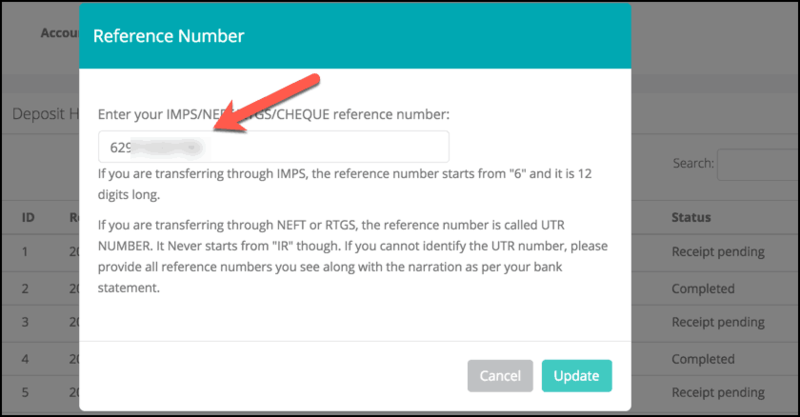 Click on the “Indian Rupee” column on left side & click on “Deposit”. On the next page, scroll down & you will see the bank details to deposit the funds. Click on “Deposit” & confirm the deposit by clicking “Yes”. Add the bank account address into your bank account. Deposit the amount that you wish to add. For this example: 10,000 INR. Note the reference number (very important). Now, grab a coffee and/or watch a movie. It will take a couple of hours before the funds will be reflected in your account. I know it’s not cool, but for now, that’s the only way by which Indians can start buying Bitcoins. After the first time, this will not annoy you as you will be used to the process. Moreover, after this, you can always use the Unocoin Android or iOS App to add funds & buy Bitcoins. Once the money has been deposited into your Unocoin INR wallet, go back to the dashboard of Unocoin & you can start purchasing more. On the next page, you can directly buy Bitcoin which can be added directly to your Unocoin Bitcoin wallet address or any other Bitcoin wallet address. Once you hit the “Buy Bitcoins” button, your transaction will happen in real-time & Bitcoins will be added to your account. Well, if you have followed all of the mentioned steps, then congratulations! You are now the proud owner of some Bitcoin. While we are done with the Unocoin guide for purchasing Bitcoin, I suggest you explore all of the other options offered by Unocoin. In particular, the one which is related to the security of your account is especially important to pay attention to. Click on Security > 2-Factor Auth & Enable Secondary Password (Google Authenticator). I will talk about the Bitcoin security & Unocoin account security in the coming days. For now, do let me know: How’s your experience of purchasing Bitcoin? What are your plans for investing in Bitcoin? This was indeed very informative for a newbie like me. Now I’d like to know to sell Biitcoins. That depends upon your location. You should consider p2p market like Localbitcoins or Paxful where you will get paid more for selling bitcoins. You can also consider popular Indian Bitcoin exchange “Coinsecure” to sell your Bitcoins. If we bought bitcoin from unocoin, can we able to sell on other sites?? Yes, you can sell it on other sites. I recommend start selling it on Localbtitcoins or Coinsecure. I like Localbitcoins as here profit margin is pretty higher. Ok. So, I bought a bitcoin from unocoin and now I want to sell it, so I need to sign up in localbitcoins and then the bitcoins will be available to sell from there ? However, i would like to know that where can we Purchase currencies like Ethereum Classic, Ripple, Dash in India. An info on that will be really helpful. 1) You can use service like Changelly or ShapeShiftto convert Bitcoin into any alternate currencies. I recently used Changelly to convert Bitcoin into Stratis & it worked flawlessly. 2) You can use Poloneix exchange where you can add Bitcoin & convert it into any currency you like. I also suggest you to order Ledger Nano S which supports wallet for Bitcoin, ETH, ETC, Dash, Stratis & few others. How much is the minimum amount i can add.. 1000 or 10000? You can add 1000 INR to get started. The Approval takes about a day or two. While you are on it, you should also open account in these three sites. Will help you in longer run. Coinsecure (This is an exchange so you can sell Bitcoins in India for margins.) 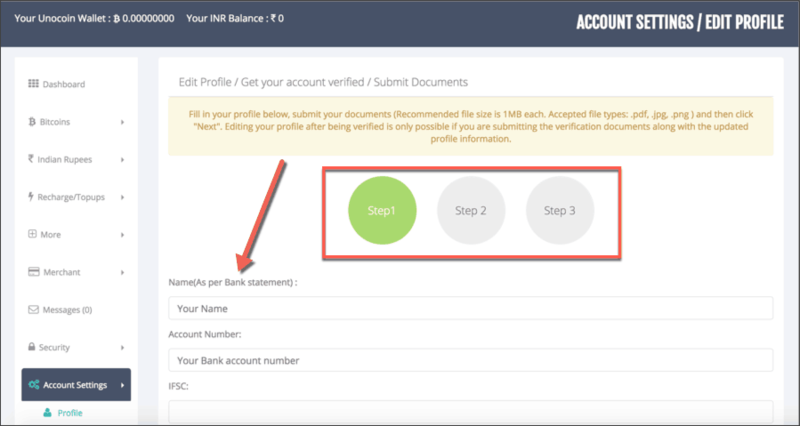 Before you start transacting on Coinsecure, read about how this works or wait for few days, as I will be publishing a guide for the same. Localbitcoins (My personal favorite as you can buy Bitcoin via various methods including Paytm, direct bank deposit or even cash. You can also sell bitcoins here). Thanks for reply. Well, i got approval from unocoin today.Awaiting next blog post. Nice tutorial for the BITCOINS purchasing. A way easy than i thought it will be. Thanks for this post! I am having blockchain wallet account to store Bitcoins, I didn’t hear about Unocoin wallet where we can convert BTC into INR as easy. I was planning to purchase bitcoin, i have opened account in unocoin ,so please suggest the minimum amt to investment in bitcoin. It all depends on your risk appetite. I would say put 5-10% of your total investment on Bitcoins & few other cryptocurrencies like ETH, LTC. Get a hardware wallet like Ledger Nano S to keep your coins secure. Hi Harsh, When i tried to buy bitcoin from zebpay or localbitcoins a lot of amount is getting deducted. Suppose if i buy 3000 worth Rs bitcoin, i’m only getting 2500 or 2600 rs bitcoin. why? That’s coz of all the taxes & fees. So other than investing, there wont be any benefit to buy bitcoins for purchasing products and services? Nearly 10 to 15% is deducted in the form of taxes and fees. If i use cards or wire transfer. transaction charges are less compared to the bitcoins? UNOCOIN is fast but does not allow the usage of credit cards yet. And No place in india allows you to use your credit cards for purchasing the BTC. Future will be better. Cryptos are still evolving and maturing in India. I agree with the lack of infrastructure. Till that time explore options like CEX.io or something similar. Is anyone facing any transaction delays with Unocoin ? A basic bitcoin transaction is not approved for more than 24 hours and there are no responses from their support team for tickets raised or the customer support calls made. I had traded on Unocoin in the past but had not experienced such delays before. A huge surge of investors. Keep patience, they will process it. Can you share latest updates about this article? I mean is it possible to buy or sell Bitcoins using with UNOCOIN at this time..?